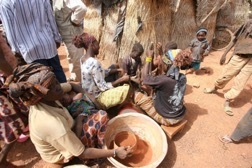 When visiting the many artisanal mining sites in Burkina Faso, where thousands of gold miners gather, women are everywhere. Not only in the food preparation area, or in the small restaurants along the dusty roads, or in the shops that make up the mining village, but much closer to the mines themselves, and sometimes even in the mining wells, or in the shallows panning or even and especially in the “back huts” pounding the stones brought up from deep underground. They work and thus contribute to the life of the family alongside their husbands or their sons who descend into the depths of the mining shafts. In the heat of the mid-day, a symphony of metal shots fills the atmosphere. Women are perfecting their craft. A good part of the day, sitting on worn mats and sheltered from the sun by blue perforated canvases, they strike the quartz or granite pebbles harvested by the miners with their metal pounder made of a mechanical part of an old truck. These rich stones have to be reduced to gravel that encapsulate the coveted gold molecules. The gravel is then passed through the slightly transformed grain mill, which backfires all day long, releasing a black smoke that spreads into the vibrating atmosphere. There, a young man grinds into a floury dust the quartz or granite crushed by women. He is indifferent, indifferent to the particles that burn his eyes and lungs, too numbed by his daily routine. Women too, breathe this dust. All day long. Dust from the mill and the quartz they pound. And with them, the sleepy little babies that they carry on their backs, the toddlers that run here or there or take a nap, rocked by the rhythm of the iron drumsticks. This scene is played in indifference. Everyone knows what is going on but nothing is done to disturb the intricacies of an artisanal miner’s life … This quartz dust is like glass! It is so small that it penetrates every recess. It enters by the nose and by the mouth, this dust deteriorates the pulmonary alveoli of children as well as women. All day and all night, in the mine sites, we hear coughing, spitting and snorting. A plethora of variations of pneumonia are present and we die from having too much hope to become less poor. Faced with this endemic problem in the world of artisanal mining, and by far this is not the only one, our team decided to organize its sites in such a way that these women can have a remunerative activity that allows them to escape the duty of pounding. From pilot groups, with the participation of community leaders, we propose to set up water saving family vegetable gardens. 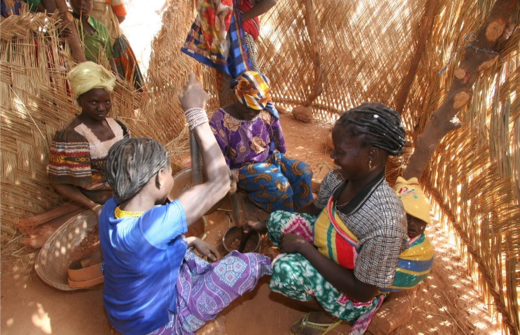 The women from the pilot groups are trained by our specialist in Sahelian agriculture. Then, little by little, these same women train others. 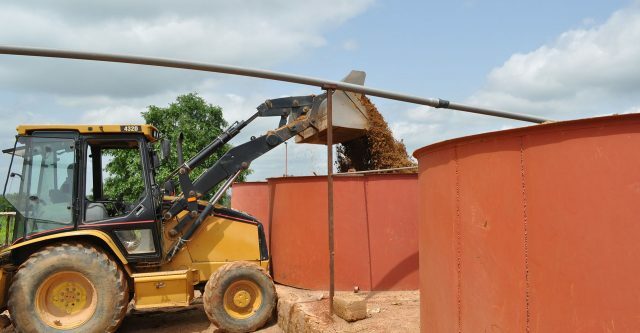 While offering economic alternatives to women who have agreed to garden instead of mineral pounding, we provide a dedicated zone for their spouses or sons with support from the mining personnel of our company, as well as appropriate crushing and grinding tools. It saves time and the health for these families of the gold mining communities! And this strategy is an intrinsic part of the Barksanem™ license. Our blog features our latest news and info updates. Go further in the discussion and engage with us at the (ASM) Artisanal and Small- Scale Mining Group: a place to discuss ASM economic strategies and technologies! The creation of Barksanem™ (BSM™) was brought about after field observations and a clear vision of territorial sustainable development, in line with the challenges of transformation described in various international accords. 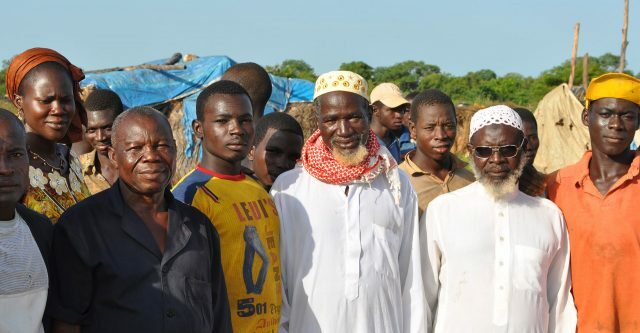 Our experience in the mining sector in Africa demonstrates the following: the harvesting of subsoil wealth is too often a source of poverty and conflict.